The first equation is the steady state condition. Income Y must equal demand Yd for activity to be stable. 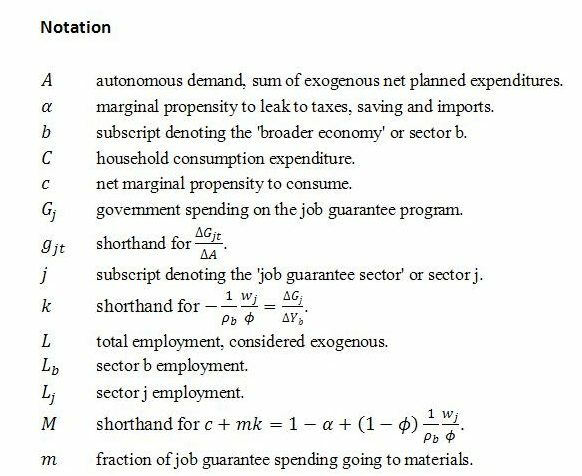 The second equation shows demand as the sum of induced net household consumption (1 – α)Y, autonomous demand and job guarantee spending Gj. Unlike other entries on the right-hand side of (4), Lb is endogenous. It depends on the sector’s income and productivity ρb. Specifically, Lb = Yb / ρb. Although it is possible to endogenize ρb to allow for procyclical variation in sector b’s productivity, here it will be considered exogenous. Additional complications can always be introduced at a later time. Corresponding expressions for the other endogenous variables are easily obtained. The steady state level of Yj is simply the expression for Gj multiplied by ϕ. The sectoral employment levels in a steady state will be Yb / ρb and Yj / wj. The margin ρb – wj is the additional income that is generated by having a unit of employment located in sector b rather than sector j. This margin is created because productivity in sector b is assumed to be higher than in sector j, where productivity is taken to equal the job guarantee wage on the basis that ρj = Yj / Lj = wj. The margin, then, is just the productivity differential. The second term in q, wj / ϕ, has already been encountered. As observed earlier, it represents job guarantee spending per unit of sector j employment. Beginning from a steady state, imagine a one-off exogenous change in demand that causes the economy to leave the steady state. Conceptually, we can suppose that this has an immediate impact on total income and sector b income but that the effects on job guarantee spending and household consumption are delayed. A key to the exercise is to keep in mind that the sum of a geometric series with common coefficient a and factor r exists so long as r has an absolute value less than one. When the absolute value of r is less than one, the terms in the series approach zero as t becomes large, and the sum of the series converges on a finite point that can be calculated using the formula on the far right-hand side. Recall that this sum relates to a system of equations for ΔYbt / ΔA. The first equations in this system are shown in (12). In (14), terms in a given row of (12) are summed horizontally with the result added to the total of all previously summed rows. Each row pertains to a particular time step. This choice was useful for describing the behavior of Yb over time, which was our aim in section 2, but it is not so helpful for obtaining a formula for the sum of the series. For that purpose, it is more convenient to sum vertically down columns and add the column sums together. Here, n bar is the n th rising factorial of t and n! is the factorial of n. By definition, zero factorial equals 1. This way of representing the numbers in Pascal’s triangle can be applied to the equations in (12). 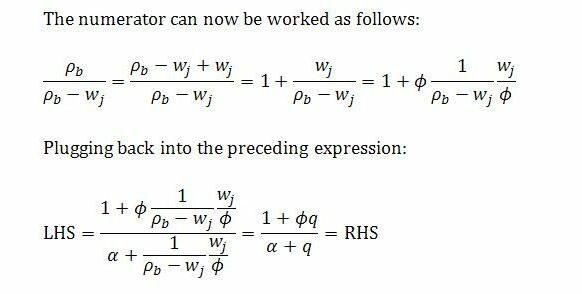 Column n in that system of equations contains numbers of type n. The t th nonzero entry in the column will be the t th number of type n.
As has been noted, this is the sum of column n. We want to find a simple formula for this sum. A way to find the formula is to substitute successive values for n into (22) and look for a pattern. The strategy is as follows. Each time a value for n is substituted into (22), treat the resulting expression as a function of M. By integrating the function n times with respect to M, it will be possible to isolate a ΣMt term. The formula for the sum of a geometric series given in (20) can then be applied, with a = 1 and r = M, to replace ΣMt with 1/(1 – M). With this replacement made, the function can be differentiated n times with respect to M to eliminate any constants of integration and solve for f (M) = ΔYbn / ΔA. 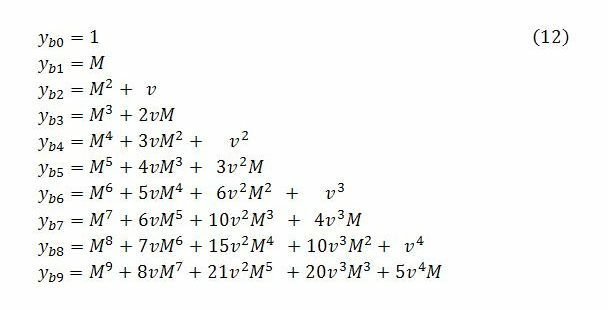 Mathematically, divergence would occur if either M + v > 1 or M + v < -1. But neither of these cases is plausible. The first case is impossible so long as there is a positive marginal propensity to leak (α > 0) because M always takes a value less than one and v is defined to be negative. The second case would make no sense from a policy perspective. For M + v to be negative at all, let alone less than -1, a unit increase in sector b income would need to be accompanied by a withdrawal of job guarantee spending that more than offset the extra induced consumption. The main way it could happen mathematically would be for the fraction of job guarantee spending on wages (ϕ) to be unrealistically small. For example, for α = 1/2, ρb = 2 and wj = 1/2, divergence would occur for a value of ϕ less than 2/15. For ϕ of exactly 2/15, the system would oscillate from one time step to the next with sector b income showing no tendency either to rise or fall. Or with α = 1/5, ρb = 3 and wj = 1/2, the system would diverge for values of ϕ less than 5/63. These choices for ϕ would be inapplicable from the policy perspective. On economic considerations, the system will always converge. From here there are no surprises. 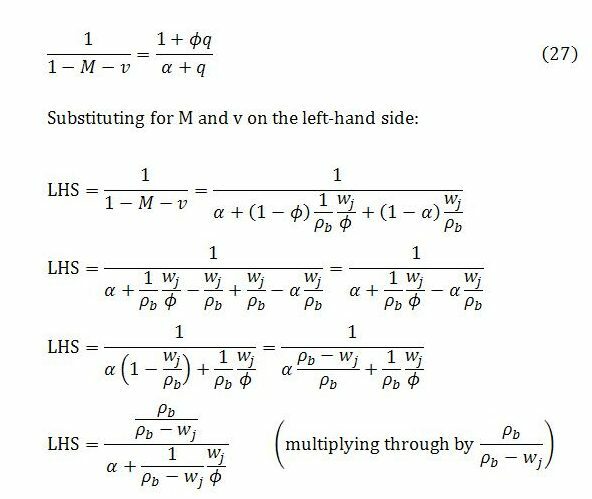 For each n, we integrate n times to get a ΣMt term by itself that can be replaced with 1/(1 – M). We then differentiate n times to eliminate the constants of integration and solve for f (M). Pardon me if I am wrong – I am error-prone with this type of material. But there seems to be a slip in equation 1. 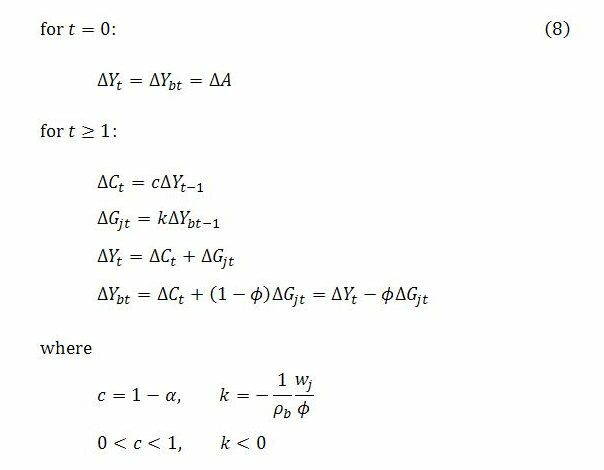 As correctly stated in equation 2, JG wages are part of Y. So in equation 1 the consumption of JG workers is already included as part of (1-α)Y. 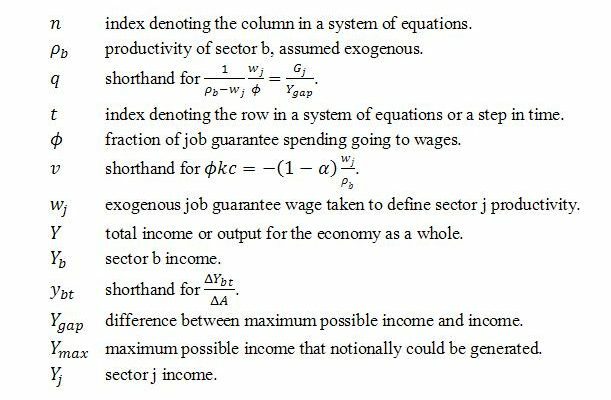 So ϕGj = JG wages shouldn’t be be added as an additional component of demand. Unfortunately, this amendment adversely affects equation 3 and most other subsequent results. There’s no problem there, but thanks for checking (and reading). Gj is expenditure on the job guarantee. It is the sum of wage payments and materials spending on the program. (1 – α)Y is induced household consumption net of endogenous imports, which includes the induced net consumption by JG workers out of their wages. The consumption of JG workers adds to sector b income, not sector j income. The materials spending on the program also adds to sector b income, not sector j income. But the wage payments to JG workers are sector j income. In other words, job guarantee spending on wages is part of government consumption expenditure. Expenditure by job guarantee workers out of their wages is part of household consumption expenditure. The government spending on sector j wages induces consumption just like expenditures do in sector b.